BM snc, founded in 1977 by Mr Tiziano Missora, was born as carpentry activity for thirds party account. 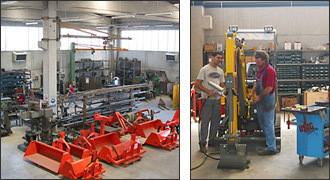 At the beginning of the 80’s BM started the production of agricultural equipments for tractors of any kind and power, quickly introducing itself in both the Italian and European markets. In 1993, the son Alberto, Mr Missora JR, joined the company, and BM started the process of diversification of production, leading the way towards the field of industrial machines distinguished by the brand COMOTER. The first models of small excavators are created, they are characterized by the fact that their components are totally made in Italy and able to adapt themselves to any kind of work and any kind of hydraulic application. In the years, and after gaining success thanks to its reliability and high quality performances, BM enlarged the range of machines, proposing itself to the market as the specialist for quantities between 7 and 20 quintals, offering a wide range of micro excavators, mini excavators, mini loader and mini backhoe loader 4WD and offering high quality standards; all this tested in the most different work conditions, from plants and flowers to road yards. Today BM is also able to offer its baggage of experience to other producers, to plan tracked components for self-moving machines of different kind. 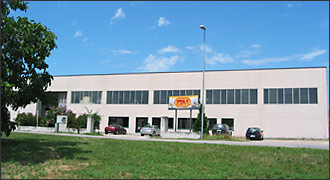 BM snc is located in the North of Italy in the Industrial Area of Motteggiana, 15 Km South of Mantova, it is easy to get here from the speed-way A22 Brennero-Modena exit “Pegognaga” following signs for Montova.